Mittens Writes: Where did the whole day go? It was supposed to be an easy day today. I was supposed to get a lot done. Since I got very little actual editing done, and it's now 10 pm, I'm scratching my head wondering how today slipped away from me. I spent much of the morning following twitter, trying to figure out if my entry was selected for the new Cupid'sLC contest (it wasn't). That wasted hours of my day, biting my nails and then feeling a bit let down. Very cool! The girls will love it. Plus, any excuse to ride a train, even if it is just the Metro, is welcomed by most of the girls in the troop. We live just far enough outside DC to make it a novelty for some of them. So that ate my day. And then dinner time arrived, and I forgot a major ingredient for the meal. I was going to make Chicken Cordon Bleu, but I forgot to buy Swiss cheese. Duh, right? So instead I made chicken cordon parmigiana. I used mozzerella, parmesan, asiago, and fontina cheeses. Really yummy, actually. And you ask, "You had all that cheese, but no freakin' SWISS?" Yes. Yes, I did. After dinner, I became obsessed with researching another agent to send my query to, and wound up reading a ton of blogs online, and finally sending out that query. I have done SOME editing today, but I think one of the main problems with my work ethic has been that it felt like a Sunday. Lulu didn't have school today, so I slept late, kind of lazed around like it was a Sunday, and basically never shifted my brain into proper writer gear. Until now, apparently, since I'm writing something longer than a tweet for the first time all day. I'm up to page 285 out of 325 in this round of edits, so hopefully we're almost to the finish line. I realized about two hundred pages ago that this will need at least one more editorial pass before I move back on to book 3, but I have a feeling book 3 will be that much easier to write because of the work I've put in to polishing the first two. Writing always seems to work like that. Perfecting one thing (at least as much as I'm capable of doing that alone, without a professional editor to help) seems to grease the wheels on everything else I'm working on. It's all good. 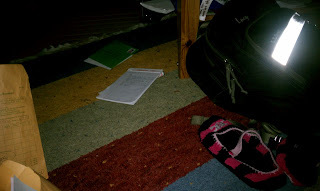 And as an aside, the picture I took of the untouched notepad bearing notes for book three? I posted it a few days ago. I don't remember exactly when. Anyway, the damned thing's still sitting in the same spot, still resting on the stupid marker. Although the junk sitting around it's changed. Sad little book 3 notes. Now surrounded by other junk, including GS cookie money deposit envelopes, the kid's backpack, and my slippers. I've vowed not to pick it up until I'm ready to start writing it again.